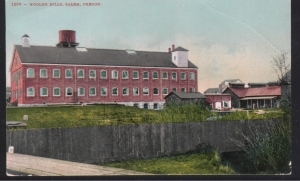 The Thomas Kay Woolen Mill was established in 1889 amid strong support from the business community who raised $20,000 in just three weeks to help secure the mill for Salem. Early in its operation, the mill employed one in every five non-agricultural workers in Salem. Fire broke out in 1895, burning the main building to the ground. The community rallied again to fund its reconstruction and within six months the mill was in operation again. The mill ran continuously, through the prosperous times of the Alaskan Gold Rush and during the thin times of the Depression, surviving a single worker strike. The mill ceased operation entirely in 1962, primarily due to competition from manmade materials like polyester. Thomas Lister Kay was born in 1837, in Appleby, England. He began his career by working in the spinning department of Billy Denby’s woolen factory. By the time Kay was 13 years old he began a full spinning apprenticeship. This early influence of working in the English textile mills had great influence on his success with American textile mills. In 1857, Kay left for America looking for higher wages in the new American mills. He left his bride of three days, Ann Slingsby, in England, but he soon returned home, discouraged by the conditions he found in the American mills. Soon after though, he decided to give it another go, so the Kays returned to America and worked in several Eastern mills. Meanwhile, the textile industry in Oregon was growing. 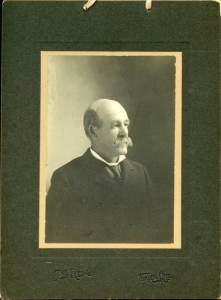 In 1862, Thomas Kay was hired to work at the mill in Brownsville, Oregon, as the loom boss. His salary was three dollars a day. 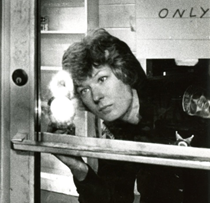 Kay worked in Oregon factories for nearly 25 years. His accomplishments included obtaining part-ownership in the Brownsville Mill. 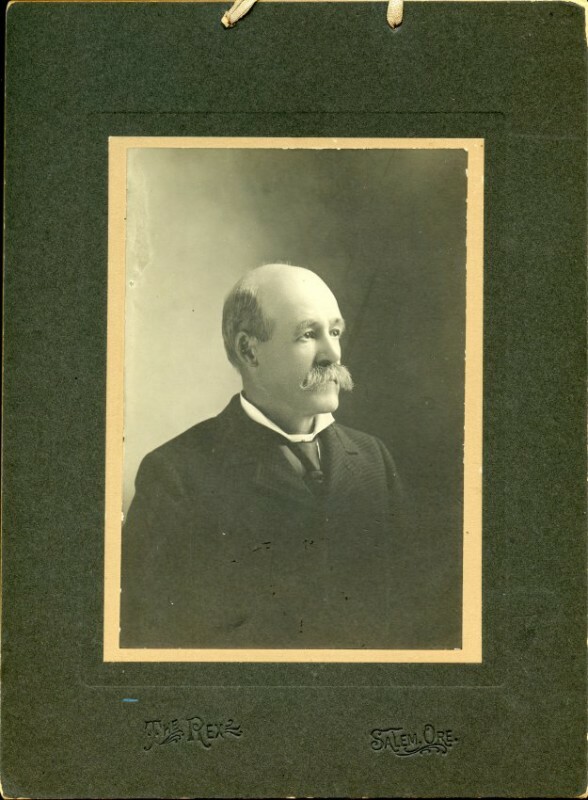 In 1888, a decision to dissolve its ownership left Kay free to develop his business interests in other parts of Oregon. Thomas Kay selected Salem to be the location for his new woolen mill, and he purchased the old Pioneer Oil Company property and its water power. A campaign to raise a $20,000 subsidy from Salem’s citizens began. This money supplemented the $55,000 that Thomas Kay personally contributed. Salem’s enthusiasm for the mill and its trust in Thomas Kay is reflected in the speed in which the money was raised. The $20,000 was pledged by 352 citizens in less than a month. With the site chosen and the property secured for the new mill, Kay left to inspect New England and English mills. Kay’s early association with the English mills gained him access to the confidential operations of the prominent woolen and worsted factories of the time. The latest equipment and the newest innovations were scrutinized and the finest quality machinery was ordered to Kay’s specifications. The Thomas Kay Woolen Mill Company was incorporated on June 16, 1889, and the factory opened in March 1890. The operation included all processes of woolen textile manufacture from sorting to finishing. Thomas Lister Kay died during surgery on April 27, 1900, after roughly a year of illness. His son Thomas Benjamin Kay succeeded him as president and general manager. Raw wool was delivered to the Thomas Kay Woolen Mill’s warehouse in large bales. It would undergo many different processes before becoming a blanket. SORTING After wool was delivered to the mill, it was sorted. Different fibers have different uses. PICKING Is the process of mechanically removing foreign particles and vegetable matter from the wool fibers by means of metal teeth on a roller. Picking machines were also used to tear up used woolen garments for reprocessing and for blending different grades and sorts of wool. DYEING this could be done in several stages of the wool processing. Dying means coloring the wool by means of chemical and vegetable dyes. CARDING The wire-covered carding rolls comb and untangle wool fibers. The web of wool formed is separated at the end of the process into distinct strips called roving that is ready to be spun. SPINNING The spinning mule twists the roving into yarn as it moves in one direction, and winds onto bobbins on the return. The spinning frame, a later invention, performs the same process in a more compact and efficient manner. DRESSING This process prepares the lengthwise, or warp, threads to be placed in the loom. The threads are wound from individual bobbins onto spools, and then onto the warping reel. From there, they are wound onto the warp beam, are threaded through eyes in the wire heddles, and then through the reed. Finally, the warp beam, the warp, the heddles in their harnesses, and the reed are all placed in the loom for weaving. WEAVING: Weaving is the crossing of warp threads running lengthwise in the loom and weft threads, or filling threads, inserted crosswise. The weft thread is added by a shuttle carrying a bobbin of yarn. Our weavers’ guild is located on the 4th floor of the mill building and is open to the public on Tuesdays, Thursdays and Fridays if you’d like to see weaving in action. PERCHING After weaving, the fabric is hung on a “perch” for inspection. Imperfections are marked, then the cloth is cut and dropped through a trap door. It is then weighed, measured, ticketed and passed on to the burlers and menders in the finishing room below. BURLING The burler finds and removes knots, bunches and loose ends, then marks any “runs” to which menders to add missing threads. MENDING Menders re-weave yarn into the fabric by hand wherever threads are missing. FULLING The fulling mills use hot water, soap and agitation to shrink fabric. This controlled shrinking “felts” wool fibers, drawing them up, and creating a denser, thicker fabric. WASHING After fulling, fabric is washed and rinsed of soap, oil and dirt. EXTRACTING Excess water is squeezed out of fabric by the spinning action of the extractor before the material goes to the dryers. DRYING In early years, the fabric was stretched to dry on tenterhooks on long racks in the tentering room on the 4th floor. In later years, a hot air machine dryer was used in a shed attached to the 1st floor. RAISING OR NAPPING A nap or pile on the surface of the fabric is raised using nappers with wire-covered rollers. When these nappers replaced the old teasel gigs, many woolen mill hands predicted the metal teeth would destroy the wool, but that did not happen. SHEARING The pile or nap on fabric is trimmed by the lawn mower-like shear. The amount of nap removed depends on the type of finish desired. PRESSING AND FINAL INSPECTION The steam press smooths the fabric and gives it a finished look. The inspector looks for any imperfections or damage; damaged goods are often discounted to the purchaser, and imperfections could affect the weaver’s pay. PACKAGING AND SHIPPING Blankets are bound and yardage is folded, rolled, weighed and labeled. Orders are readied for shipping.